Christmas time in Chicago is one of the best times of year! It's that sweet time when the winter weather is fresh and lovely before the long winter sets in. Everyone seems to be happy and smiling as they go through the city. There are lights, snow and hot chocolate to be found everywhere. 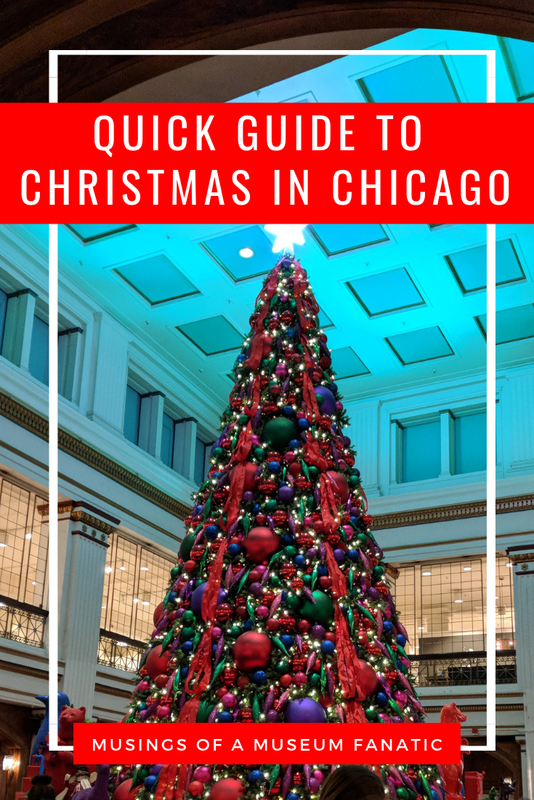 I've got your quick guide to really enjoying the holiday season in Chicago. The best part about enjoying Christmas lights is that they're all over the place and there are so many spectacular ones throughout the city and suburbs. For one stop shopping for lights I would recommend heading to Lincoln Park Zoo or Brookfield Zoo. 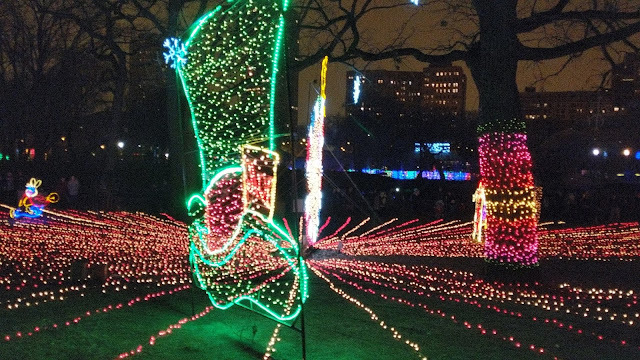 While you might have to enjoy the lights with lots of your new friends you won't be disappointed in the sights. 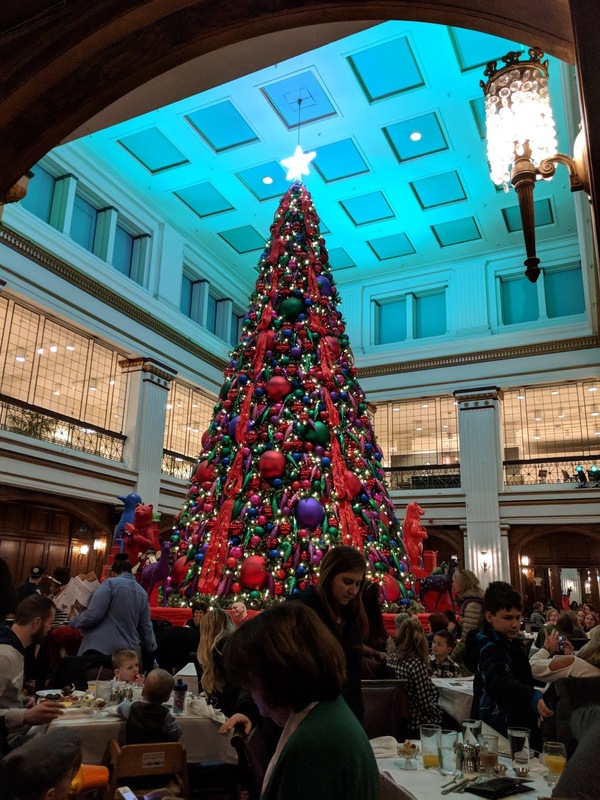 Since 1905 the Walnut Room has been entertaining people during the holidays. It's most well known for it's iconic, gorgeous tree in the middle of the restaurant. They don't take reservations during the holidays so you'll have to get there early to put your name down but it's definitely worth the wait! Kevin and I are hoping to have lunch here during our staycation this year. Tried last year but underestimated that there would be that many people. I highly recommend the Frango Mint Ice Cream Pie, it's pretty life altering. Chicago usually is decorated for whatever holiday is happening but there is nothing like the city being all decked out for Christmas. There are massive window displays at stores like Macy's and Christmas decorations in the greenery put out by the city to lights in everyone's windows. Plus when everything is covered by the lovely white December snow there is nothing quite like it. I always enjoy just strolling around taking in the beauty. You can really enjoy it in any neighborhood too it's not limited to just the Loop. You'll find all sorts of lovely holiday teas around the city. For the grand daddy of Chicago holiday teas you'll want to check out the tea at the Drake. The ornate Palm Court looks every more amazing when all decked out for Christmas. You're going to feel like you've stepped into another world. It's the perfect get dolled up event for the holidays. For the other end of the spectrum you can hit up TBOX or the 12 Bars of Christmas bar crawl. It's a full day of bar crawling through Wrigleyville with hundreds of your new, drunk best friends. Everyone gets dressed up in crazy Christmas and theme of the year costumes. You're taking shots of cereal and shots of alcohol. It's a blast. 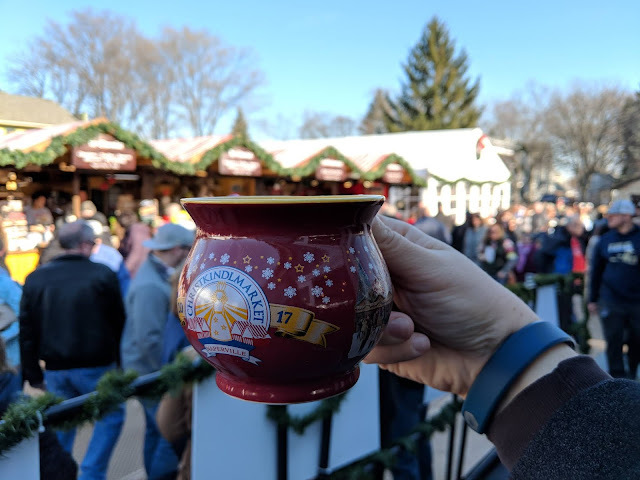 Every year we enjoy going to the Christkindlmarket! You'll find ornaments and gifts from Germany and all over the world. Delicious hot chocolate from the mug of the year and chocolate dipped everything. Although the chocolate dipped Rice Krispie treats are my absolute favorite. We love to get an ornament from the market each year to add to our tree and remember our fun holiday tradition. 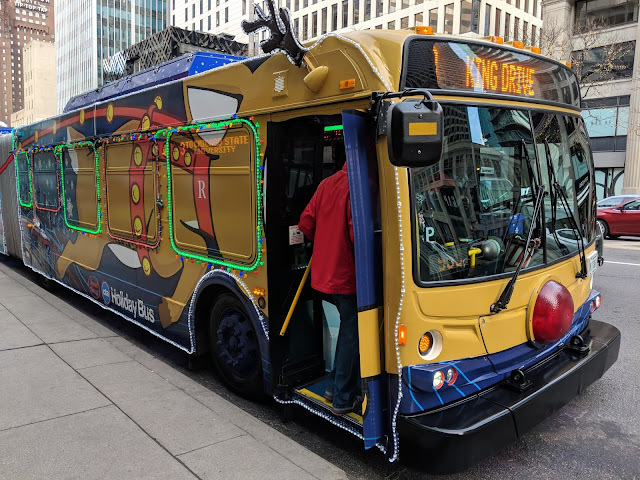 If you're looking to get indoors but still experience some holiday fun the Polar Express is the perfect event for you. Taking off from Union Station this one hour train ride is filled with fun, singing, Christmas cheer and so much more. 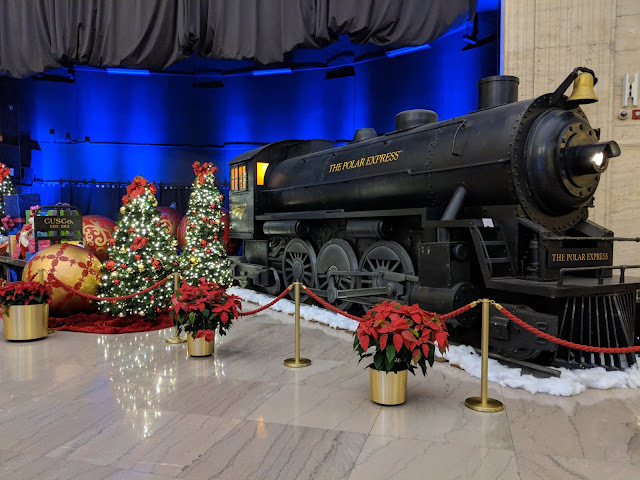 I remember way back when in high school we used to do a once a season type of polar express on the Metra trains but now this Amtrak and Warner Brothers version takes you through the entire month of December and a little bit into January. I love it when holiday events get extended that week between Christmas and New Year. Throughout the month of December you'll find the CTA and Allstate have paired together to bring holiday cheer to the city of Chicago by way of the holiday train and bus. This year it's double the fun on Saturdays with an elves' workshop train as well! One thing I didn't realize is that there is another purpose behind the trains. They're delivering food baskets to various charities throughout the city, this is actually how the train got it's start.